“InfoPro is an extremely professional investigative firm….” Why should you Chat Live for a free consultation…. Many Americans travel for business on a monthly basis or more frequently. 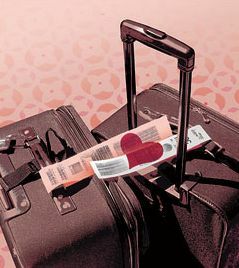 Business travel can be used as a tool to cover up an affair or the affair may have been the result of frequent travel. InfoPro Investigations has conducted investigations in Minnesota and throughout the U.S. that involve spouses that are having an affair while traveling for business. If your spouse is traveling frequently, lying about their travel plans or changing their plans often they may be using travel to conceal their affair. Infidelity is about opportunity and travel is an excellent opportunity to be away from the suspicious eyes of a spouse. If you suspect your spouse is traveling frequently and having an affair we can help. InfoPro Investigations are experts in detection and the investigation of infidelity! Business travel often provides a cheating spouse the perfect cover for an extramarital affair. They are the most common settings for infidelity, according to “The Normal Bar” by Chrisanna Northrup, Pepper Schwartz and James Witte; 36 percent of men and 13 percent of women told the authors that they gave into temptation while on a business trip – even if they said they were happily married.